The Super Bowl holds a special place in my childhood memory. It was Super Bowl XIX, and the San Francisco 49ers were playing the Miami Dolphins at Stanford Stadium. History was taking place in my hometown, and at least four separate children’s choruses were brought together to form the “Super Bowl Children’s Chorus” and sing The National Anthem. I was 11 years old and, as a member of the San Francisco Boys Chorus, I was there on the field with roughly 100 other children right in the center of it all. The 49ers emerged triumphant, and the day served as an inspiration for thousands of fans, me included. I went on to play football myself, though not professionally, and the sport has continued to play an important role in my life. This weekend, I will attend the Super Bowl for the second time, and, yet again, it will be in my hometown. My role in this Super Bowl is quite different, though, and the Super Bowl itself will be far more historic. This year marks the 50th anniversary of the Super Bowl, and I will be among a group proudly representing SAP as we celebrate our collaboration with the National Football League, the Super Bowl Host Committee and a number of great partner organizations and companies. Sports bring people of all different backgrounds, cultures and nations together in celebration of not only triumph in athletics but also in celebration of what’s possible more broadly. That includes triumphs of technology and business. The Super Bowl presented a rich opportunity to showcase technology in a way that was accessible to sports fans and others who are not immersed in the technology world. This was our chance to make the cutting edge accessible to people, showing them its potential in a real way that provided them with not only a fun experience but one that was engaging, inspiring and even useful. If you are among the lucky few able to attend the game at Levi’s Stadium, you’ll see a number of opportunities to engage with the rich repository of data and information about the game and the players. We teamed up with the NFL to create player-comparison tools as well as technological enhancements made specifically for Super Bowl 50 to help people more deeply experience the game and follow-up via e-mail to track how certain players performed. Those experiences are limited to the few thousand people who are fortunate enough to attend the game itself. What about the people who want to experience the Super Bowl outside of the stadium? We worked with the NFL and the Super Bowl Host Committee to make sure their needs were met as well. 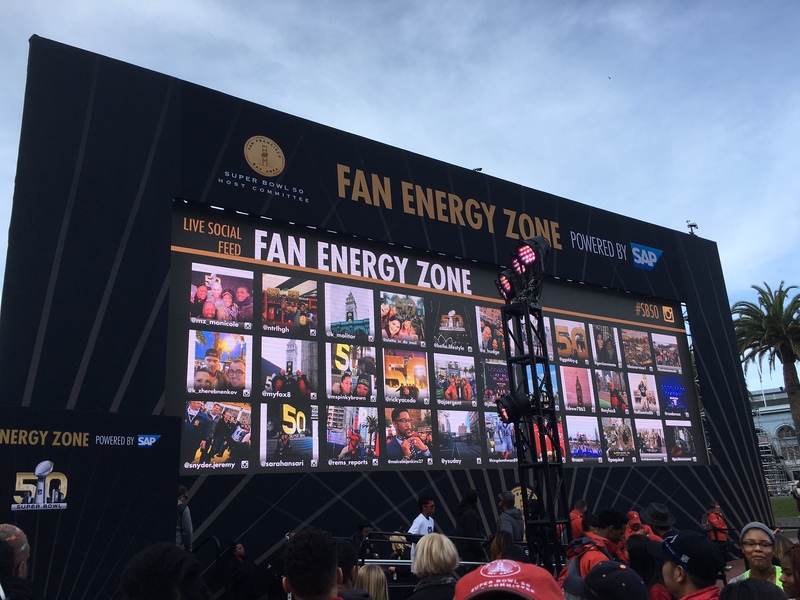 If you find yourself in San Francisco during the Super Bowl celebrations, check out Super Bowl City and the “Fan Energy Zone powered by SAP”, which features virtual reality, data visualization and motion capture technologies in three separate games: “Quarterback Challenge”, “Amp It Up” and “Breakaway”. For the “Quarterback Challenge”, visitors will be able to don a virtual reality headset and become a quarterback. In “Amp It Up”, they can perform their own half-time show, measuring fan reaction through a musical and dance game. “Breakaway” gives them the chance to pretend to catch a ball and run with it, also using motion-capture technology. Visitors can have their scores captured on their player ID, which each visitor receives when they arrive. There are also 5,000 people who have signed up to volunteer for Super Bowl 50, so we also designed a mobile app to coordinate that effort and provide volunteers with a valuable, social experience to manage schedules, participate in virtual training and access event info. All of these points of engagement are data-driven, interactive and, most importantly, they were created using human-centered design and powered by SAP HANA. Traditionally, we have been seen as a product company, leveraging design thinking to think about next-generation solutions and products. There were products involved in our design for Super Bowl 50, but overall this was a bit different for us in that it was experience design rather than product design. We had to think about all aspects of the visitor experience — arrival, registration, retrieving a player ID for the interactive games, the experience for those in line and how to teach people the games quickly. Most importantly, there was the question of how to keep the experience memorable. That last question led us to design the follow-through experience, providing people information about their game performance via e-mail. We worked closely with the Super Bowl Host Committee to place the fans and attendees at the center of our design. We conducted design thinking sessions with members of the NFL and the Super Bowl Host Committee, and we also conducted empathy and need-finding work with fans to design the best possible Super Bowl experience. Beyond the nuts and bolts of designing the experience, this collaboration is particularly meaningful to me in that it presented an opportunity to show how technology can enhance the human experience. Artificial intelligence, virtual reality and other technologies that stand to play a key role in the digital transformation can, when designed with people at the center, bring us together, help us better coordinate and more effectively communicate. These types of uses are on display at Super Bowl City and in Levi’s Stadium in a way and on a level that is accessible to those who might not have experienced technology like this before. So, if you have the chance to enjoy these experiences, I hope they are not only fun but that they also inspire you to think about technology in new and different ways. Oh, and before I go, if you’re wondering how I did during my own tour through Super Bowl City, I think I held my own! You’re welcome to see for yourself, and if you get a chance to visit, I hope to hear how you did as well. In the meantime, enjoy this great city, have a great Super Bowl and, to the players and fans, have a great game.